Years ago, before the rabbits and the squirrels invaded my garden, I grew Sunflowers for the pure enjoyment of they way they looked. SUNDANCE a happy bright cheerful reminder of the lazy days of summer. Because I like to fuse it makes it very easy to manipulate my designs and fusing also allows the use of fun detail added in with decorative rotary blades. In making SunDance I used two decorative blades, the wavy blade and the pinking blade. Lots of times in class students ask me if you couldn’t just use the decorative scissors that are so popular, but really those scissors don’t work well on fabric, they don’t let you cut long curving smoothly cut designs the way the blades do. Each of these decorative blades fits easily in your 45mm rotary cutter. I remind you that if these blades are already in a rotary handle you are much more likely to use them, so get a handle for each of the blades you own and go play with the possibilities. 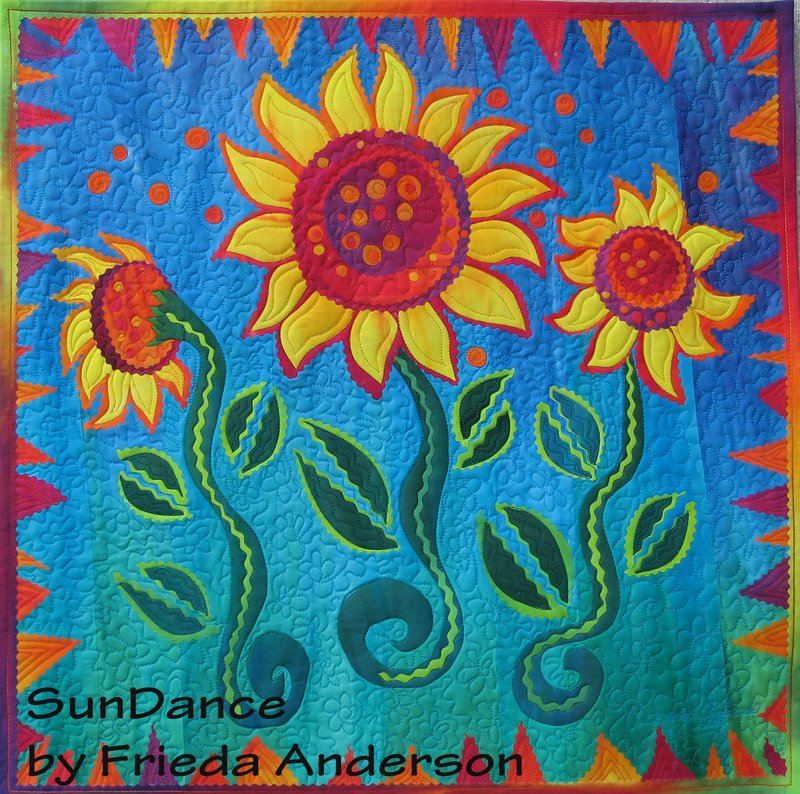 I will be teaching this class coming up next month at the Maine Quilt Fesitval in Augusta Maine on Sunday July 26th. Maybe I’ll see you there?